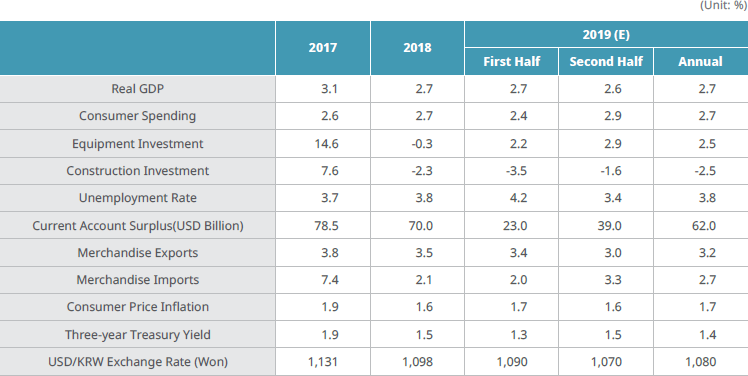 The Korean economy is expected to remain weak amid sluggish domestic demand and slowing equipment investment, with its GDP growth estimated at 2.7 percent for 2019. Escalating trade tensions between major economies may affect Korea's exports adversely, and rising financial market volatility in some emerging economies is another external factor that may pose a risk to the Korean economy. Consumer spending is expected to rise by 2.7 percent in 2019. A hike in interest rates could pressure consumer confidence due to greater interest costs on household debt. A delayed improvement in job market conditions is also likely to dampen consumer confidence. However, the government's stimulus measures and rising wage income levels may help keep private consumption from slowing sharply. Equipment investment is projected to recover modestly, growing by 2.5 percent in 2019 following a sharp decline in 2018. Investment spending in the semiconductor industry started to slow down this year, leading to a decrease in overall equipment investment. Most major industries except for the petrochemical and IT sectors are likely to curb their spending on equipment investment. The construction sector is also reducing their investment as supply exceeds demand. In 2019, construction investment is expected to decline by 2.5 percent, with the housing sector slowing down rapidly amid excess supply. The non-housing sector is also experiencing a decrease in construction starts, and a cut in government spending on infrastructure is expected to render civil engineering works sluggish. The nation's export conditions do not seem promising given the ongoing trade conflict between China and the United States and weakening growth in major economies in the world. Consequently, a slower growth is expected for merchandise exports in 2019. Exports of IT products such as semiconductors and display panels may contract due to base price decreases, while exports of non-IT goods especially petrochemicals are likely to see a sharp slowdown amid slowing upward movements of international oil prices. Consumer price inflation is forecast to remain subdued at 1.7 percent in 2019. Economic weakness and the stabilization in oil prices are reducing inflationary pressure. The core inflation rate, which strips out volatile food and energy prices, is projected to be 1.6 percent next year, up from 1.2 percent this year due to the upward trend of wage growth and hikes in utility prices.